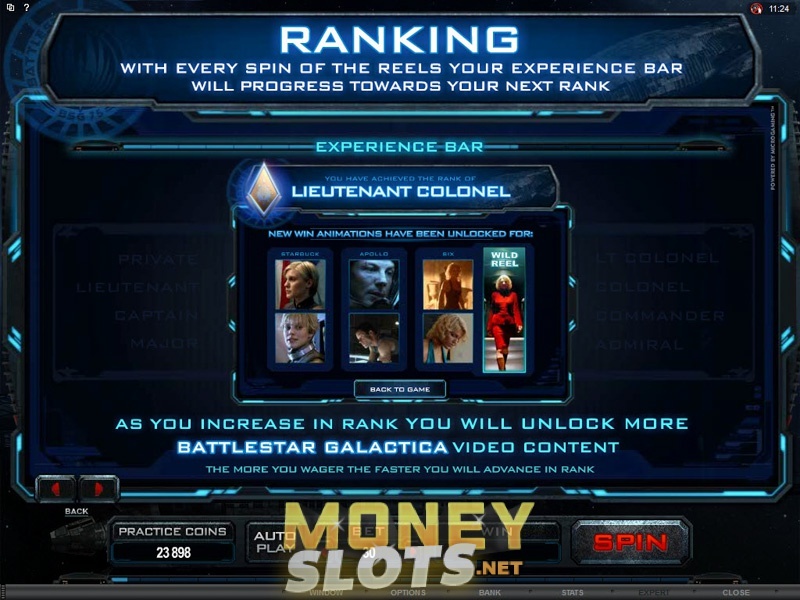 Making its appearance in Microgaming casinos since December 2012, Battlestar Galactica Video Slot is based on the extremely popular Sci-Fi TV series and it gives you an opportunity to get reacquainted with the characters of Commander William Adama and President Laura Roslin among others. Featuring 243 ways to win, numerous bonus rounds and three different modes, this is clearly one of the most exciting games to have been developed in 2012. All you have to do to start playing this attractive slot machine is select the coin size and amount of coins to wager per spin, and hit spin to begin your adventure. The game will start in Normal mode, but at any point in time you could be taken to Run mode and finally Fight mode. All these modes contain unique Wild and Scatter symbols as well as special bonus spins. Battlestar Galactica TV series may have finished, but this is your chance to relive the story line and spend some time with your favourite characters that come to life thanks to video scenes available once you hit a winning combination. Every spin of the reels will get you closer towards your next rank, and the more you wager the faster you will advance in the rank. Enjoy this unique video slot and experience three different modes, all of which come with special perks and bonus rounds. Battlestar Galactica offers 243 ways to win and while there are no paylines, the goal is to get matching symbols on adjacent reels. Images of main characters from the series are appearing on the paylines, alongside playing card symbols 10, J, Q, K and A. The Battlestar Galactica logo is Wild symbol and Viper fighter spaceship is the Scatter symbol. The game can be played for free or real money, so all you have to do is pick the bet amount and hit spin. Autoplay feature is also available, with several different options. As all casino games, Battlestar Galactica is a game of chance, but there are some ways to try and improve your chances of winning. The golden rule of gambling says never bet more than you can afford, so you should definitely set the amount you plan to spend on your favourite game. With so many bonus rounds, free spins and special awards that you can win while playing this game, the best strategy is to stay in the game for as long as possible, seeing that increases your chances of getting special perks or even hitting a jackpot.